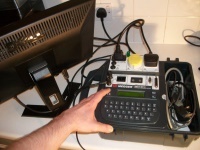 Portable Appliance Testing (PAT) using a good quality industry standard tester which will perform the test and produce itemised records for the client. This testing satisfies an organisation's obligation to adhere to a number of statutory acts including the Electricity at Work Act. Chiefly Regulation 4(2) of this act which is concerned with the need for maintenance to be done in order to ensure safety. 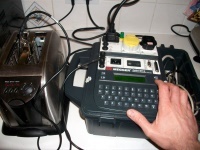 (Of which regular inspection & testing of equipment is essential). 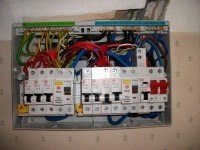 Elektrico Electricians are qualified to install consumer units (Fuse Boxes) in a safe and compliant manner. 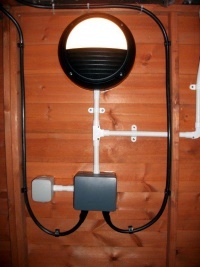 In this installation we leave the house for the garden shed. Hence, the armoured cable and the lights and sockets of the correct IP rating installed Consumer units are not one size fits all. 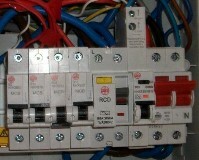 The image shown is the right hand side of a split board. 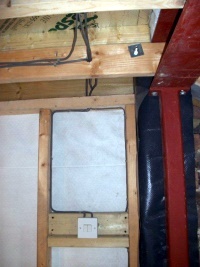 A large red switch for double pole isolation. Four miniature circuit breakers (MCB) supplied through one residual current device (RCD) and one combined RCD and MCB (RCBO) for that troublesome circuit. First fit in a new domestic installation. Cables neatly dressed around the supporting woodwork can be physically examined for integrity alongside the relevant electrical measurements and testing. Although no current requirement to conduct periodic testing in the domestic environment, domestic appliances in the business environment should still to be tested. 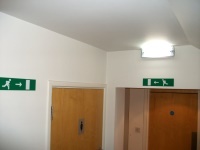 Emergency lighting above emergency exit route Emergency lighting built into emergency exit sign above emergency exit. 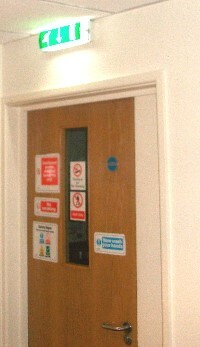 Emergency lighting built into emergency exit sign above emergency exit door. 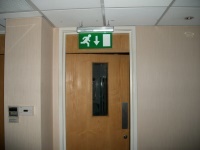 Transparent emergency exit to left sign.